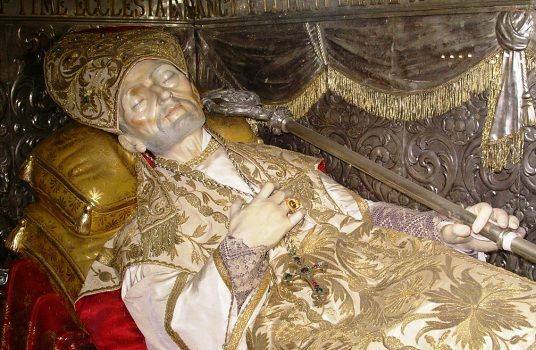 Saint Alphonsus de Ligouri, founder of the Redemptorists, great writer and Doctor of the Church (declared by Pius IX); patron of moral theologians. Saint Alphonsus also was instrumental in founding the Redemptoristine nuns and several other congregations including the one founded by Pio Bruno Lantern who took the constitutions of the Redemptorists for the Oblates of the Virgin Mary. Saint Alphonsus spoke eloquently of priesthood and the dignity and beauty of properly exercising this particular grace. The Psalm for today says much about Saint Alphonsus’ charism: “teach me your statutes, O Lord.” What can be truly said about the man than to teach the law of the Lord? Indeed, today’s saint did much to assist the faithful in being close to God in prayer, seeking the virtuous life, being penitential and to have a good zeal for the salvation of others. One common thing we ought to recall is that Alphonsus gave us what some now call the traditional prayers for the Stations of the Cross. The Mass prayer praises and petitions God, to give us the grace he gave to Saint Alphonsus in being an example of virtue for the sake of heaven. Other saints and blesseds of Saint Alphonsus’ religious congregation: St. Clement Hofbauer, St. John Neumann, St. Gerard Magella, Blessed Peter Donders, Blessed Kaspar Stanggassinger, Blessed Gennaro Sarnelli, and Blessed Francis Xavier Seelos and at least 5 other beati. Plus, there a few on the way to sainthood such as Venerable Father Alfred Pampalon, and the 4 martyrs of Ukraine, and the 6 martyrs of Cuenca, Spain as well as Antonio Maria Losito declared Venerable in 2015, and 8 other Venerables. The spirituality of Saint Alphonsus has produced many holy men raised to, or on the way to being raised, the holy altar.